Israeli police officers abducted, Friday, four young Palestinian men at the Central Bus Station, in occupied Jerusalem. 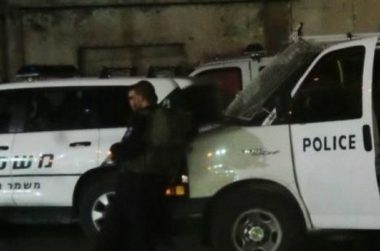 The police claimed the four Palestinians attacked Israeli soldiers, mildly wounding one of them, before they were detained. Media sources in occupied Jerusalem said the incident seemed to be an argument between the four Palestinians and the officers, before it developed into a scuffle. They added that the Palestinians were cuffed and blindfolded, before being moved to an interrogation facility in the city. In related news, the Israeli police detained, on Thursday at dawn, two young men who reportedly fired live rounds at the Ramla and Hadarim Prisons, a week earlier. The Police said the two are from Jaljulia Arab town, north-east of Tel Aviv, and added that they fired at two guardhouses in the detention facilities.